Callithumpian Consort is back! — and ready to kick off the new season. We’re in Jordan Hall on Thursday, October 4th with an intimate program, focusing more inside the ensemble to reveal our individual, virtuostic soloists. The opening concert features two premieres (a Harbison world premiere, and a Roberts US premiere) performed by cellist Benjamin Schwartz. All in all, the night contains a wide-ranging array of detailed sounds and ideas, coming from around the world and stretching deep into the mind and imagination. Karina Fox begins the evening with Tristan Murail’s C’est un jardin secret, ma soeur, ma fiancee, une source scellee, une fontaine close… . The subtle work, written for viola (and as a wedding present for two of Murail’s friends), is described by Julian Anderson as “an exquisite miniature” containing the particular timbres and senses we come to identify as coming from Murail’s soundworld. Next, Trevor Bača gives us this pristine image for his Sekka (for unaccompanied flute): “Shining white sounds. A shifting multiplicity. And an intense and sculpted whisper.” The title essentially is a fusion and play on the Japanese characters for “snow” and, in part, “flower”, opening to a beautifully minimal analogy perfectly suited for the design and structure of the instrument. Flutist Jessi Rosinski performs. Clarinetist Rane Moore and pianist Elaine Rombola team up to explore the sonic contours and extremes in the terrain of Jonathan Harvey’s Be(com)ing, and cellist Benjamin Schwartz presents two premieres this evening: Invention on a Theme by Wm. 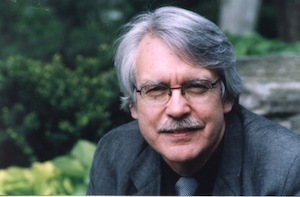 Shakespeare by John Harbison (a world premiere) and Anakhtara by Adam Roberts (US premiere). Both are commissioned works; the Harbison was commissioned for Schwartz’s 40th birthday (a treat from family and friends), and the Roberts piece was commissioned by the cellist himself. Gabriela Diaz performs Roger Reynolds’s Kokoro for solo violin, a 27-minute work in 12 parts, exploring the idea of “kokoro” in its various meanings: the actual, physical heart, the emotional “true” heart, the mind, soul, and spirit (Daisetsu Suzuki). According to a program note, Reynolds found this multi-tiered concept to be “irresistable”, and in a performance note, imagines the ideal performance as “involv[ing] the assumption of an entirely new psychological stance for each of the parts.” Finally, we close the night with the conceptual Georges Aperghis’s Les guetteurs de sons, performed by percussionists Mike Williams, Jeff Means, and Nick Tolle. Join us for this rare program highlighting our soloists within the Consort — Thursday, October 4th in New England Conservatory’s Jordan Hall at 8:00 PM; free admission. Not to be missed! Notes: Tristan Murail “C’est un jardin secret, ma soeur, ma fiancee, une source scellee, une fontaine close…”, Trevor Baca “Sekka”, Jonathan Harvey “Be(com)ing”, John Harbison “Invention on a Theme by Wm. Shakespeare” (world premiere), Roger Reynolds “Kokoro”, and Georges Aperghis “Les guetteurs de sons”.